Volunteer Paillant Bod (left) and Jacelys de Pena pack groceries at the Catholic Charities Archdiocese of Boston Yawkey Center food pantry in Dorchester. In Dorchester, a rumor that federal agents were lying in wait in the parking lot of a food pantry kept immigrants away. At Boston Medical Center, a woman seeking medical help fled after the front desk receptionist asked for her name and identification. In Chelsea, victims of domestic violence are so afraid of deportation, advocates say, they are reluctant to file restraining orders against their abusers. Across the state, many immigrants and refugees are too frightened by President Trump’s hard line on immigration to step forward for the most basic and critical of services, according to doctors, immigration lawyers, and advocacy groups. “This fear among refugee and immigrant communities is unprecedented,” said Dr. Sondra Crosby, who runs the Immigrant and Refugee Health program out of Boston Medical Center. Crosby and others who provide services to immigrants are scrambling to reassure vulnerable populations. Advocates for domestic abuse survivors have handed out pamphlets and cards explaining the legal rights of anyone who is detained or questioned about their immigration status. Boston Medical Center has sent out hundreds of letters to patients explaining that their immigration status and medical records won’t be released to the federal government. Crosby personally called incoming patients to reassure them they would be safe at the hospital. “We don’t want people to be afraid to get medical care,” she said. Federal statistics show that fears of a more aggressive immigration policy are not unfounded. In the first two months of Trump’s presidency, the number of federal arrests in Boston of unauthorized immigrants who had not committed a crime tripled to 156 compared with the same time period last year, when President Obama was still in office, according to numbers provided by US Immigration and Customs Enforcement. The agency also issued 22,161 detainer requests nationwide during the same time frame, nearly double what the agency issued during the same time period the previous year. Immigrants, even those who have become US citizens, have become reluctant to register for any kind of service if it means providing a name and an address or any other personal information. she said. A person left a community center with their bag of donated food. 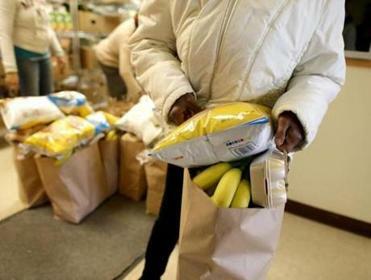 Meanwhile, Joseph Burnieika, director of Catholic Charities in Greater Boston, has witnessed that hesitation at the organization’s food pantry on Columbia Road. The charity asks clients to provide their name and address so that the pantry can keep track of how much food has been given out — each family receives one bag of groceries a month. Pantry workers do not ask about immigration status, but some people would rather forgo receiving food than give their personal information, according to food pantry workers. “A lot of people blatantly said, ‘Oh no, I don’t want to be in anything that’s going to get me in trouble with the government,’ ” said Sabrina Boisaubin, office manager at the Haitian Multi-Service Center on Columbia Road, site of the food pantry. Jacelys DePena, a 36-year-old volunteer at the pantry and an immigrant from the Dominican Republic, has had to reassure neighbors that no one is going to share their address or name with ICE. Burnieika said pantry workers have allowed friends and families of immigrants to pick up food for those too scared to come themselves. On a busy day, 120 people will show up at the pantry. The Monday after Trump issued the executive order temporarily banning travelers from seven countries and all refugees from entering the United States, only 31 people came to the pantry. “I’ve never ever seen anything like this in my life,” Burnieika said, adding that longtime clients are slowly returning. “What I haven’t seen a lot of is new people,” he said. Trump’s executive order to ban travel from specific majority-Muslim countries has been halted by the courts, but he continues to push for building a wall along the Mexican border, and he also signed an executive order calling for stepped-up border security and enforcement of immigration laws. He has also threatened to strip certain federal funds from cities and towns that refuse to honor ICE detainers by holding immigrants for possible deportation. HarborCOV in Chelsea, an organization that helps survivors of domestic violence, holds a support group twice a month. Typically, 15 survivors will attend, but in recent weeks only one to three participants have shown up, said Kourou Pich, co-executive director of HarborCOV, which stands for Communities Overcoming Violence. Sixty percent of the nearly 1,000 adults and children helped by the group annually are immigrants and refugees. Victims who are legally in the United States or whose children were born here and qualify for state benefits such as food stamps and money for transportation have told service providers they are too afraid to collect them, Pich said. “There is a whole fear in general of asking for help,” Pich said. Immigration lawyers who are referred patients by the Massachusetts General Hospital Chelsea HealthCare Center have noticed the same pattern. A lawyer from the Lawyers’ Committee for Civil Rights and Economic Justice regularly uses a small office in the hospital to see patients with legal questions. Recently, fewer people are coming in, said Iván Espinoza-Madrigal, the committee’s executive director. He said his organization is trying to come up with legal strategies for health centers struggling to reassure patients. Lawyers and doctors at Boston Medical Center MC recently met for a similar purpose. Maria Cramer can be reached at mcramer@globe.com. Follow her on Twitter globemcramer.